A stray bullet flew through the window of a condo in the 400-block of North Lake Shore Drive Sunday night. 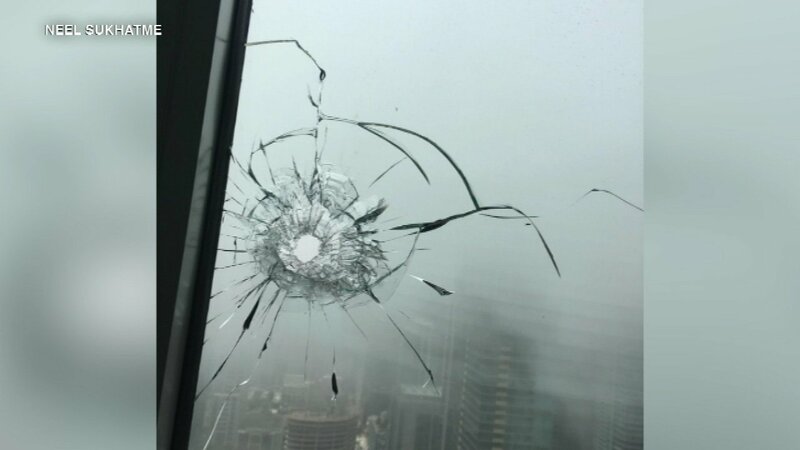 CHICAGO (WLS) -- A man says a bullet came through the window of a Chicago high-rise, and now he's trying to figure out who fired the shot. Neel Sukhatme said he was doing some work late Sunday night after his children went to bed when he heard a loud noise and felt glass flying. He said a bullet came through the window of his parent's condo on the 56th floor of a high-rise in the 400-block of North Lake Shore Drive. "It's conceivable someone maybe was just trying to mess around and shot a rifle shot, maybe trying to hit the lake or something. Or they were aiming for a window and hit it," he said. "If it's a random shot, I know stuff happens in Chicago. But what worries me is that it's not a random shot." No one was hurt. Chicago police are investigating.